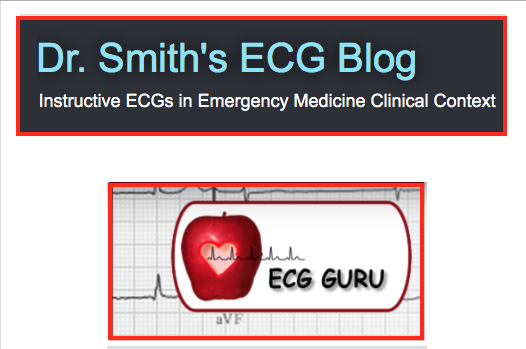 This is the 15th installment of my ECG Video Blog. 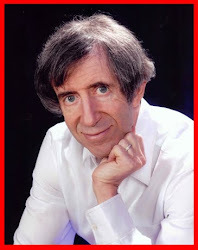 This 65-minute video reviews QRST Changes (and Applying a Systematic Approach). There is a LOT of material in this video — so you may want to view it in more than a single session. Click on the link below for a detailed linked CONTENTS (so that you can easily navigate through the video). Ability to illustrate concepts not done full justice by the written word. Greater dispersion of my content through Google & YouTube. This material is free for anyone to use. ECG Video-Blog #1-Revised (= Blog #95) — Is there AV Block? Click Here for Timed Contents to the QRST Changes Video! 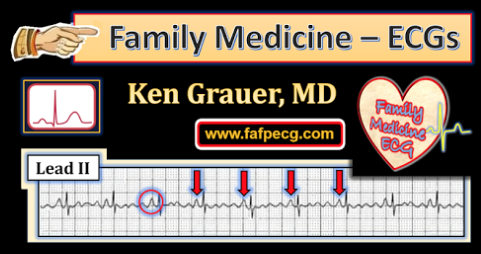 This is the 15th installment of my ECG Video Blog (www.QRSTecg.com). This video is 65 minutes long — so you may want to view it in more than a single session. If you click on the description just below the Video on YouTube – you’ll see a detailed linked CONTENTS, so that you can easily navigate through the video. 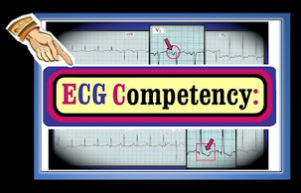 There are 3 main parts: i) Initial thoughts on the use of a Systematic Approach to ECG Interpretation; ii) Detailed discussion on how to assess for QRST Changes (assessing Q waves; R wave progression/Transition; ST-T wave changes); and iii) Practice Tracings that put concepts presented in the first 47 minutes of the video together. NOTE: I aimed my content at an Intermediate level interpreter (with emphasis on BASIC concepts plus LOTS of PEARLS for more advanced interpreters along the way). Hope you enjoy this! I welcome your feedback! 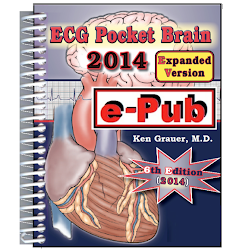 (Ken Grauer, MD – ekgpress@mac.com). Figure-1: Schematic Figure from this video on QRST Changes (CLICK HERE to Fast Forward to 31:10 in the video where use of the PR & TP segment baselines is discussed). One could use either the PR or TP Baseline for assessing ST-T wave deviations. We often use a combination of both (depending on specifics for the tracing at hand). 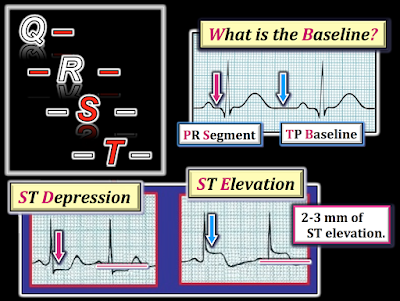 Below in the Figure we illustrate 1-2mm of ST depression (left) — and 2-3mm of ST elevation (right). NOTE — Enlarge by clicking on Figures — Right-Click to open in a separate window. Click Here — for a Timed CONTENTS of Video-Blog #15 on QRST Changes. 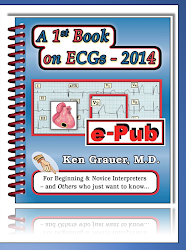 Please also see our ECG Blog #94 ( = Basic ECG Concepts #7 on QRST Changes). The PPT show is without automatic sound. YOU activate only the Audio clips you want. 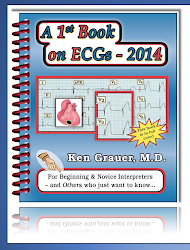 This is the 14th installment of my ECG Video Blog. This 29-minute video reviews Recognition of Type-1 and Type-2 (Saddleback) Brugada ECG Patterns, with essentials of management for the non-cardiologist. There is focus on distinction from the right bundle branch block and normal variant patterns, with suggestions on when to refer. 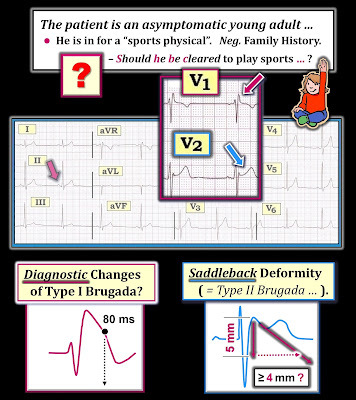 Click Here for Timed Contents to the Brugada Syndrome Video! My goal in this 29-minute video is to simplify recognition of Brugada ECG Patterns (Type-1 and Type-2) in a user-friendly approach based on current literature. Key Points for recognition of Brugada-1 and Brugada-2 ECG Patterns are shown in Figure-1 below — taken from our Video discussion. (These points are summarized at Minute 19:15 in the Video). Figure-1: 12-lead ECG from an asymptomatic young adult who had this tracing done as part of a sports pre-participation exam. Should the patient be cleared to participate in vigorous athletic activity? Or — Is there a Brugada-1 pattern in lead V1 and/or a Brugada-2 (Saddleback) pattern in lead V2? Schematic illustrations below highlight key recognition points for Brugada-1 Pattern (downsloping ST segment still elevated above baseline at 80 msec. after the r' peak) — and — Brugada-2 Pattern (wide ß-angle, as defined by a triangle base of ≥4 mm after dropping a 5mm vertical line from the r' peak — and after following the slope of the downsloping ST segment after the r' wave). NOTE — Enlarge by clicking on Figures — Right-Click to open in a separate window. 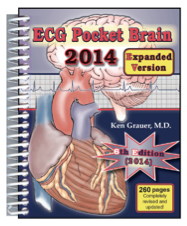 Click Here — for a Timed CONTENTS of Video-Blog #14 on Brugada Syndrome. 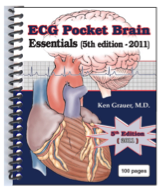 Please also see our ECG Blog #50 and the pdf from Section 05.33 (from our ECG-2014-ePub) — for more on Brugada Syndrome.